Call me crazy, but I'm not really looking forward to Surrogates. The concept is intriguing, I'll admit, but the trailer and all the footage I've seen from has looked terrible. Plus, some of this imagery is just so creepy or even odd, that I just can't get into it, I'd rather not look at it than show any interest. But that's just me, as I know there are a lot of people excited for it, and I haven't featured much from it in a while. Disney has released a small batch of new photos from the film that caught my eye (as there are a lot of new photos from tons of movies this week). Check them out and read on for info on a new Breaking Benjamin music video. MySpace has a music video for Breaking Benjamin's single "I Will Not Bow" from Surrogates - watch here. If you haven't seen it yet, you can actually already watch the trailer for Surrogates online by clicking right here. Set in a futuristic world where humans live in isolation and interact through surrogate robots, a cop is forced to leave his home for the first time in years to investigate the murders of others' surrogates. 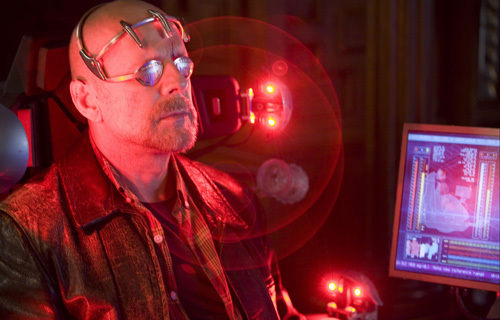 Surrogates is directed by action filmmaker Jonathan Mostow, of Breakdown, U-571, and Terminator 3 previously. The script was written by writing duo Michael Ferris and John D. Brancato, of The Net, The Game, Terminator 3, and Catwoman previously. The film is based on Robert Venditti's graphic novel of the same name. Disney will be bringing Surrogates to theaters everywhere on September 25th this year. Aren't movie supposed to feel some sort emotion from movies, Alex? The first two aren't that bad, but the Bruce-Willis-Bad-Hairpiece shot needs to go. 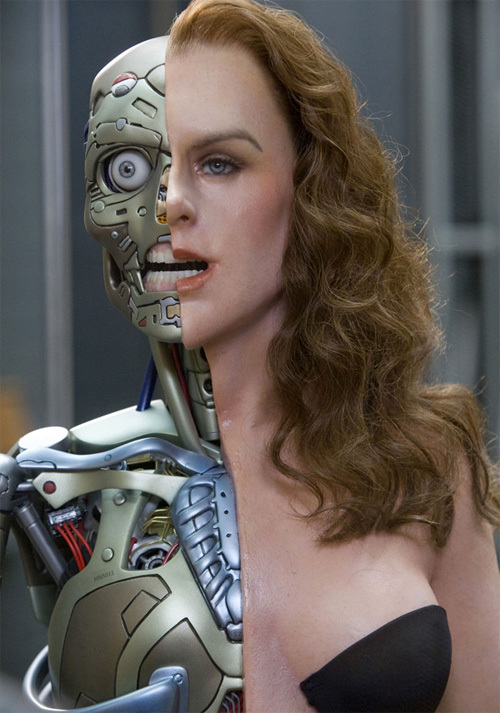 Also the half terminator woman looks pretty bad, I hope that isn't the final look, because it looks half woman half plastic. Aha that is the same hairpiece he had in The Jackal when he picked up the guy in the gay bar. Alex I will have to disagree with you here. I think this film shows a lot of promise. I for one Can't wait to see this. Bruce Willis with hair creeps me out. concept is good, but the deliver isn't good enough to get me into the theater. No idea how this one will turn out. I'm predicting a final score of 43% on RottenTomatoes. are you people who are complaining about the hair-piece aware that the bruce willis with hair is actually the surrogate, and not bruce willis himself? the surrogate can look like however the owner wants it to look, so obviously bruce's character has decided to make his surrogate a younger version of himself (with lots of hair). everyone really aught to consider checking out the graphic novel this movie is based on, it's an excellent read and well worth your time. Total Recall with Arnie looks like it has better special effects and plot than this one! @3 - what the hell are you even trying to say? Jeez, the last picture looks terrible, lol. This movie actually looks pretty good to me. At least it's not another remake! Since when is creepy and odd a bad thing? Movie will probably be a decent rental though. Bruce Willis' hairpiece looks better than this movie, and that's not saying much. The screenplay was amazing. Total page turner. They're trying to sell this as an action movie but it's more of a noir sci-fi mystery thriller. The last image does look like that in the film because it's just a display model set up at the company that produces the surrogates. This film also has an amazingly emotional and suspenseful subplot that deals with estranged relationship Bruce's character has with his wife. The ending is amazing. People think that trailer gives surprises away, but it doesn't--at all. I'm not @3 I have a name! Well what I'm saying minus the typo, is movies are supposed to envoke emortion in you, and this emotion is I guess creepy emotions!